Chelsea vs. Aston Villa : 23 December 2012. This game was all about getting back in to the groove again. After my fantastical flight of fancy to Tokyo, there was a chance that the game with Aston Villa might be a test of my dedication, or at least my enthusiasm. However, this would be my oldest CFC mate Glenn’s first game since Munich, so it was all about getting him back in the groove, too. Glenn collected me at 11am. This was to be a treat for me; a door-to-door collection and delivery service which would enable me to get a few beers down my neck. With Lord Parky having an extended leave of absence (he was unable to travel due to a few ailments rearing their ugly head once more), this was just like the old days for Glenn and myself. As he headed over Salisbury plain and past Stonehenge, we chatted about my experiences in the Far East. And we chatted about the past. I have known Glenn since 1977 and started going to football with him in 1983. With a house and mortgage to pay for, he stopped going regularly in 1986 and it was a couple of years before our paths would cross, excepting a few boozy conversations in various Frome hostelries. In November 1988, with Chelsea starting to find our feet after relegation to the old second division, I was up in London for the game with Sunderland. I was working in the cold store of a local dairy in order to save some money to embark on a lengthy holiday in North America (starting point unknown) but was still going to a Chelsea game every four weeks or so. I had travelled up on the train to Paddington by myself, and was on my way to Fulham Broadway to meet my college mate Ian, who would eventually accompany me on my jaunt around the US and Canada in 1989. It would have been around midday and I was on the southbound district line train, just south of Earls Court. I looked up and who should be standing opposite, no doubt clocking the talent in the train carriage, but Glenn. “Hello mate. What are you doing here?” I said ironically. Kevin Wilson equalised, but it was a poor game. 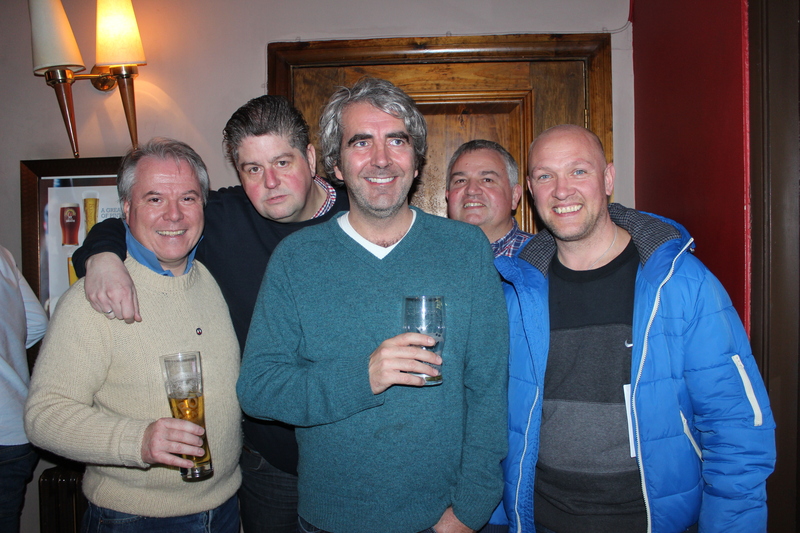 After the game, Ian and I met up with another mate in the West End and we embarked on a pub-crawl – as was often the case in that 1988-1989 season – before heading back to their gaff in Woking on a late train from Waterloo. Twenty-four years later, Alan, Glenn and I would be drinking and laughing again. In The Goose, everyone was thrilled to see Glenn once again. As it happened, there was a more than healthy turnout from friends all over England. The Nuneaton posse were well represented. Simon, fresh from the filming of his biggest feature “Still,” was back in circulation along with his son Milo. The filming has gone very well and it is “in the can” awaiting the laborious process of editing. Simon promised us all places at the premier. I can’t wait for that. Glenn was all smiles as he hopped around the tables, chatting away to the folks who make our Chelsea so special. I know it is the festive season, the time for over-sentimentality, but we are both truly blessed to know so many “top geezers” at Chelsea. The game was hardly mentioned as we walked down to The Bridge. I saw that Villa had a block of around 100 seats that they couldn’t sell out of their 1,400 allocation. At least we wouldn’t have to endure their “Have you won the European Cup?” ditty on this day and subsequent others. Elsewhere, it was another sell-out. I quickly had words with John, Kev and Anna about Tokyo. Anna brought me back a pack of “Chelsea” butterscotch from Japan. I remember that Alan brought us all back the same product from one of his work jaunts to Tokyo around ten years ago. I suppose that the big talking point was the pairing of David Luiz with Frank Lampard in the defensive midfield positions. Although Luiz is by nature a defender and Frank is more attack-minded, we hoped that this would work. I’d be happy to try out a more attack-minded formation such as this at home games. The pairing of Romeu with Mikel – to use another option – hasn’t worked too well. Glenn was sat next to Tom – both dressed in light blue jackets, like two peas in a pod – and Alan was next to me. The boys back together once again. “Like Glenn in the ‘eighties” I responded. We didn’t have to wait too long for further reason to smile. After only two minutes, Azpilicueta sent over a perfect cross for Fernando Torres to meet it a good 15 yards out. With a header which Didier Drogba would have been proud, the ball was sent crashing into the Aston Villa goal, with Guzan unable to react. It was Torres’ 26th. goal in Chelsea colours. As he raced away to the south-west corner flag to celebrate, I snapped away. In those photographs, there is joy on the face of Torres and his team mates alike. There is no reason to believe that there is “distance” between him and his team mates, despite the rumours amongst our support of him being disinterested and selfish. Sure, Torres went through a horrible spell over the past month or so, but so did the whole team. But before that, he was working hard and scoring the occasional stunner, such as the goals against Newcastle and at Arsenal. I’m sure that the Torres of around five years ago, when Liverpool largely played a counter-attacking game – even at home – under Benitez, is long gone. Think of how many times Torres broke through to latch on to long balls from Mascherano, Alonzo and Gerrard and the ball ended up in the Kop net before anyone could blink. Those days are gone. Chelsea have, ironically, too much possession for that style of play to aid Torres. Our build-up is involves more touches. However, Benitez was absolutely correct to say that we need to get the ball up to him quicker. It makes me chuckle to hear the legions of pro-Drogba / anti-Torres “supporters” in our midst as they complain about Torres’ lack of involvement, lack of desire and selfish and sulky behaviour. Such derogatory comments were continually-levelled at Didier Drogba throughout every one of his eight seasons with the club. From 2006-2007, the diving abated. The petulance and moody behaviour didn’t, but that was Drogba. In comparison, the shy Torres – a different beast completely – needs support. It can’t be easy to be the absolute focus of a team’s endeavours, especially with a £50M price tag and the horrible start he had in Chelsea colours. But let’s continue our support of him. After all, he is a Chelsea player. It’s obvious to me that Torres lacks self-confidence, but we can help rebuild that. It’s a two-way process. But that confidence is so brittle. At Sunderland, his confidence was at an all-time high when he positively took the ball and struck home a penalty. A week later in Tokyo, he looked like his confidence was shot away completely after missing that one-on-one with the Corinthians ‘keeper. I was mortified. The sad thing is that throughout that entire season, the PE teacher – a Kevin Keegan lookalike called Mr. Freeman who still resides in the town – never ever came up to me to give me a pep talk or to offer advice. A show of support would have worked wonders for me I am sure. The clichéd arm was never put around my shoulder. In 1979-1980, and the subsequent few years, I played for the B team and never regained my place in the first team. My confidence was shot. Let’s all put our arm around Torres’ shoulder, plus any other player who is suffering through a loss of that vital commodity, confidence. This has always been my view. I don’t go to Chelsea to berate players unnecessarily. Sure, I get exasperated at times, but I just wish fellow fans would offer whole-hearted support at games, rather than become 40,000 critics. A Luiz free kick seemed to bamboozle the Villa ‘keeper and we were 2-0 up. A scramble from a corner was headed home by Ivanovic and we lead 3-0 at the break. Although there had been a minute of applause for Roberto on 16 minutes, there had been no anti-Rafa noise throughout the first-half. We played some lovely football in the second-half as Villa’s resistance simply melted away. I caught Frank’s low drive from thirty-yards on film and how we celebrated that. He was replaced shortly after by Ramires and received the loudest bout of adulation all season. Villa amazingly caused Cech to deflect a shot onto his crossbar, but Chelsea simply carved out more and more chances, too numerous to catalogue here. I missed the Ramires goal as I was outside on a comfort break, but more goals soon followed. First, a penalty from Oscar. My personal favourite was the delightful piece of wizardry from Eden Hazard, a few yards in front of me. His skills were lighting up the early evening and his strong dribble into the Villa box was followed up with a strong strike high into the goal. At this point, the Chelsea faithful, who had been watching with growing bemusement and befuddlement, chose to ridicule the away supporters. Lucas Piazon, making his league debut, was fouled and it was another penalty. After Luiz, Ramires and Oscar, would he become the fourth Brazilian to score? Alas, his strong penalty was tipped over by Guzan. Amazingly, there was still time for one more goal, when Ramires slotted home after a lovely ball from Oscar. After the game, a few of us reconvened over at the Lillie Langtry at West Brompton where we tried our best to quantify what we had just witnessed. To be honest, we tried and failed. We surely live in interesting times. This entry was posted in Season 2012-2013. and tagged 1988-1989, 2012-2013, Aston Villa, Childhood, Didier Drogba, Fernando Torres by Chris Axon. Bookmark the permalink.